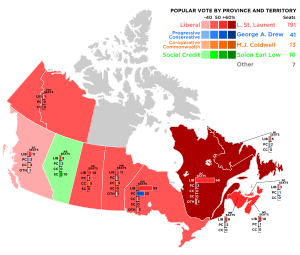 The Canadian federal election of 1949 was held on June 27 to elect members of the House of Commons of Canada of the 21st Parliament of Canada. It was the first election in Canada in almost thirty years in which the Liberal Party of Canada was not led by William Lyon Mackenzie King. King had retired in 1948, and was replaced as Liberal leader and Prime Minister by Louis St. Laurent. It was also the first federal election with Newfoundland voting, having joined Canada in March of that year, and the first election since 1904 in which the parts of the Northwest Territories were granted representation. The Liberal Party was re-elected with its fourth consecutive government, winning just under 50% of the vote. This victory was the largest majority in Canadian history to that point and remains, by any measure, the largest-ever majority won by the Liberal Party. As of 2017, it remains the third largest majority government in Canadian history. The Progressive Conservative Party, led by former Premier of Ontario George Drew, gained little ground in this election. Smaller parties, such as the social democratic Co-operative Commonwealth Federation, and Social Credit, a party that advocated monetary reform, lost support to the Liberals, and to a lesser extent, the Conservatives.